Are you a dasher or an eker out? When you discover a new author whose books you love, do you dash through them all at top speed because you're enjoying them too much to put the brakes on, or do you eke them out so as to make them last? I'm a dasher. Always have been. 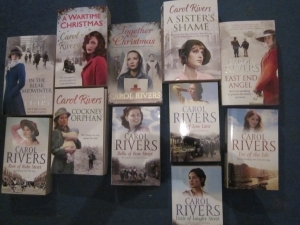 But at the end of last year, I made a decision to eke out some books - specifically, the sagas written by Carol Rivers. Last Christmas, I read A Wartime Christmas and loved it. It was a page-turning, can't-put-it-down, won't-waste-time-going-to-sleep book, the kind every reader hopes for. On the strength of that, I bought East End Angel, which was another terrific saga and, no, I didn't get much sleep while I was engrossed in it. As you can see, I've got all the rest and by rights, I should have devoured the lot long since; but - for the first time ever - I have been eking them out. Why? Well, books this good don't come along every day and there is a certain pleasure in knowing that when the next reaches the top of the TBR pile, I'm guaranteed a superb read. But I am still a dasher at heart and here is a series I have recently gulped down with enormous enjoyment. 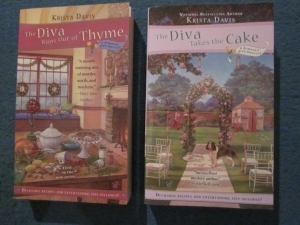 The Domestic Diva books by Krista Davis are an American cosy crime series. They are clever, funny, all-hands-on-deck mysteries and, oh my goodness, the food descriptions make your mouth water! And aren't the covers gorgeous? I love American cosy crime and the cover illustrations add to the delight. The Diva covers are designed by Diane Kolsky and illustrated by Teresa Fasolino. 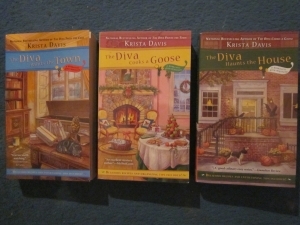 If you're familiar with the series, you'll know that there are more Diva books after these five, but not to worry: Santa knows what a good girl I've been this year. So which are you: a dasher or an eker? I'm an ecker. I read for the story but also to understand how the writer has constructed it and what I can learn from their approach. I also use a new book by a favourite author as motivation and a reward. Enjoyable post, Susanna. Thank you for highlighting this important difference between readers. Great post Susanna. I'm definitely a dasher. I read The Girl with the Dragon Tattoo trilogy back to back. And I'm a dasher when I'm reading too. Not disrespectful to the author's efforts (because living with a fiction writer I know what it entails) but because there's just so much to read and I want it all! Before I started writing full time, I was a complete and utter Dasher!! And even dared grumble when I'd caught up with the author. I didn't like waiting around for the next book :) But now I realise just how much hard work and time goes into writing a novel, I have become a lot more respectful and take my time reading a variety of authors and genre (although secretly I do occasionally tap my fingers waiting for my favourites to get a move on - sshhhh don't tell :)) A Wonderful post, Susanna. All the very best.